Work can be incredibly dull when everything becomes routine. You go to work, sit at your desk, do your job, and go home at the end of the day. More often than not, you’d rather have a more exciting time elsewhere than to be in your office working, but you also have to earn to make a living. Luckily, there are ways in which you can change things up. Change the way you dress, add some color to your desk, or even start using an adjustable desk riser. 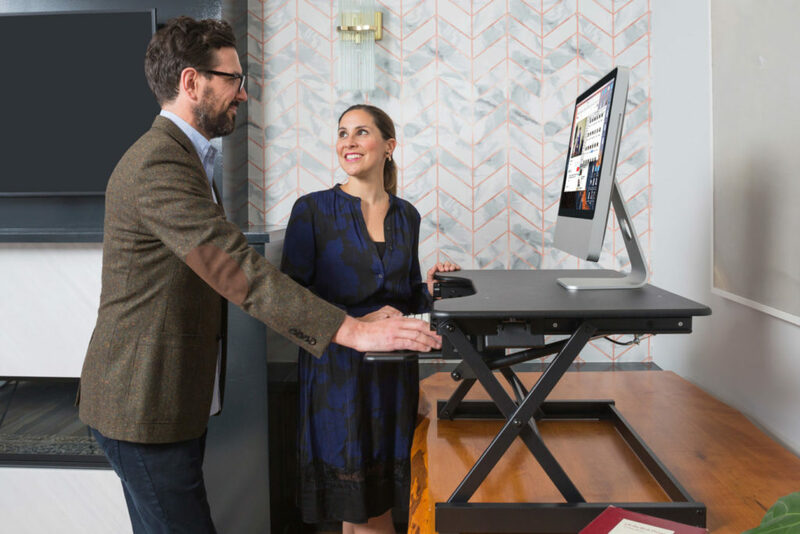 Standing desks are rising in popularity nowadays, and there are loads of benefits into using them. Here are ten that you might want to know if you’re considering getting one. Ever wanted to shed a few pounds but you didn’t have the time to work-out? Unbeknown to many, using an adjustable desk riser can result in burning a few calories. About 0.7 calories are burned every time you stand for an unusually long time. Now, this may not seem so much, but when you add up all your working hours, you’ve practically burned the same number of calories as when you work-out in a gym. At least here, you don’t have to sweat so much that you tire yourself out. Using an adjustable desk riser enables you to work and earn money while achieving or maintaining a trim figure. More than burning your calories, a standing desk riser can also help you lower your blood sugar levels. Various studies have proven that long periods of time spent standing up have lessened spikes in blood sugar levels by 43% more than hours spent sitting down. Other researches have also proved that standing can reduce blood sugar levels by 11.1% on average. It’s possible that the adrenaline one feels when standing up for an extended period can be the direct cause to this positive effect. 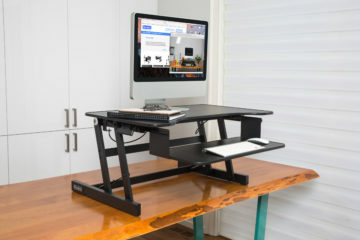 Along with the weight-loss, the lowering of blood sugar levels proves that using an adjustable standing desk riser is hugely beneficial to one’s health. Out of all the health benefits of using an adjustable desk riser, lowering the risk of heart disease is possibly the oldest and most established. Since 1953, medical professionals have pointed out that standing up for a substantial amount of time lessens the risk of contracting life-threatening heart disease by 50%. The act also gets your cardiovascular systems moving and energized as compared to its stationary state when you’re sitting for long hours. The difference of effects on one’s cardiovascular health between standing up and sitting down is so vast that it’s said that not even working out for a couple of hours can reverse and match the effects. When you’re sitting at your desk for almost your entire day, your energy decreases over time. On the other hand, if you spend the day standing up with a standing desk riser, you’re more likely to accumulate as much energy to last even the entire week. Standing up for long periods of time keeps your body active. No parts of your body will suddenly fall asleep nor become limp. Additionally, you can even move about a little while you work, as compared to staying completely stationary when you’re just sitting down. Let’s face it, sitting around for hours can lead to your mind becoming completely blank. You may be working during these extended hours, but your brain has gotten so used to such a routine that it ceases to remain active for anything else. Your mind is relatively blank to other elements in the office aside from your tasks. As opposed to when you’re standing up while using an adjustable desk riser, since your body is not in an extremely relaxed position, that small strive for comfort keeps your mind more active and energized. You still can focus on your work, but you’re also more alert when other things happen. Sitting on your desk for an extended period enables you to separate yourself from your surroundings unconsciously. Your office becomes a sort of territory where your focus solely lies. Suddenly, you’re not aware of what other people are doing or if there are other people in the room in the first place. 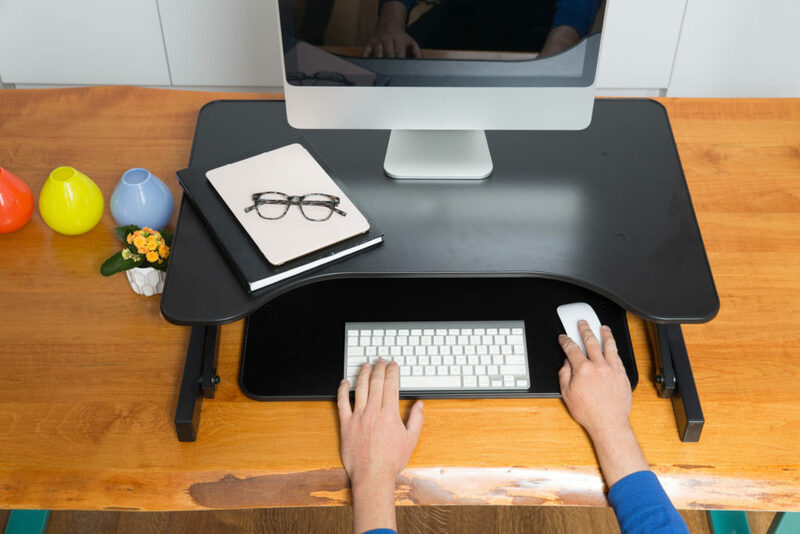 Using an adjustable desk riser allows you to stay completely aware of the world around you. The height alone of when you’re standing up gives you better hearing and vision to what’s going on beyond your own space. Standing up doesn’t make you so relaxed that you’re suddenly oblivious to the other on-goings in the office. Now that your mind is more active and more aware of your surroundings, you can use it to boost your productivity as well. More of than not, your body remains as active as your brain when you use an adjustable desk riser. Because you’re not in a stationary state for the entire day, your body doesn’t become limp or numb. You can move them as you please, thereby being able to do a lot of things even in just one day. In no time, you might find that all your tasks have been completed and it isn’t even time to go home yet. A few studies have shown that standing up can reduce back pain better than sitting down. One, in particular, found that their backs even felt better after long hours of standing up compared to spending the same amount of time sitting down. Since your body is in its natural straight position when standing up, the natural curvature and formation of your bones aren’t disrupted during this period. While you’re most likely hunching down a little, you’re not in a position that, when spent several hours in, can induce a lot of pain and stress. Do you and your back a favor and get a standing desk riser for when you work. Don’t deny that when you sit for long hours during work, you’re most likely hunched down or slouching. You may think it’s the most relaxing position to spend the day in, but it’s not the most beneficial to your posture. Using an adjustable desk riser can exponentially improve your posture compared to just sitting around. Your back is straight, your shoulders are leveled, and your chest is out. The perfect position might not mean so much these days, but it’s always a plus to have one. Probably the best benefit of using an adjustable desk riser is that it can improve anyone’s mood during work. Because of all the health benefits listed above, you’re more likely to feel better and have a sunnier outlook in life. When you’re just sitting around. It’s easier to feel blue, bored, and irritated. In contrast, using a standing desk riser can easily keep you fresh, happy, and completely energized. If you suddenly want to change things up in your professional career, why not get an adjustable standing desk riser? They’re easy to use, is a unique change, and has multiple benefits to you and your health. You might even find that after using one, you’ve turned into a healthier person and a better employee.